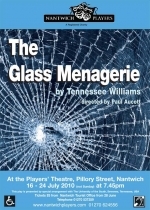 A compassionate drama set in St Louis in the 1930s and first performed just after the end of World War II, The Glass Menagerie by Tennessee Williams. This is a sensitive play, not to be confused with his later works Cat on a Hot Tin Roof and Streetcar Named Desire. In a strong cast two Nantwich Players "veterans", Virginia Meir and Neil Hodges, were joined by two new members, Lucy Desmond and Robert West.